The mission of the Resident Association of Greater Englewood is to mobilize people and resources to force a change in the community by breaking down barriers in communication and promoting positivity through solution-based approaches. Download our updated brochure here! Help us continue our efforts by donating today! Residents in Englewood feel enraged: We are upset about the ways our community is portrayed in the media and we are frustrated with the current conditions of our neighborhood, despite the abundant presence of churches, non-profits, and social service agencies. In late 2010, several residents living in Greater Englewood decided to take matters into their own hands. Through their fellowship, R.A.G.E. was soon created. 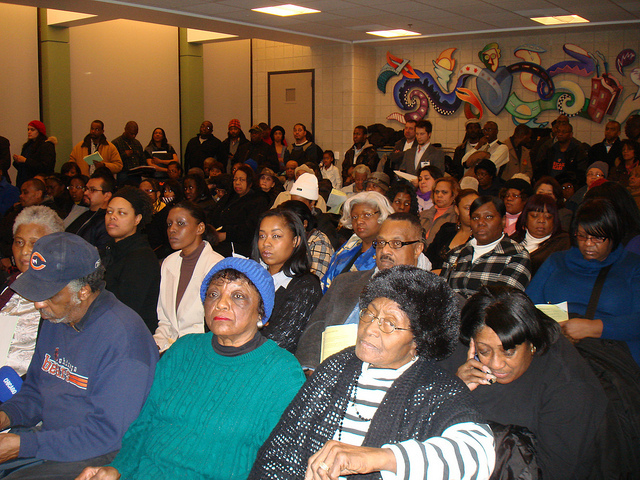 The Resident Association of Greater Englewood represents new leadership within the community. This resident-funded and resident-led association consists of members who reside in all 6 wards of the Greater Englewood area. R.A.G.E. members are homeowners, stakeholders, business owners, professionals, students, parents and grandparents fighting against the stereotypes that often stigmatize Englewood. Although R.A.G.E. seeks to holistically empower the community, there are currently several areas and issues that R.A.G.E. seeks to address. With the recent release of the 2010 Census data, R.A.G.E. has been at the forefront of the redistricting process – working to help re-draw the boundaries of Greater Englewood and pushing for at least one ward office in the neighborhood. At the beginning of the year, R.A.G.E. hosted three aldermanic candidate forums for the six wards in the election (Wards 3, 6, 15, 16, 17, and 20) in Englewood. The forums were created to give residents the opportunity to learn more about the candidates, who in-turn were able to share what their goals are for Englewood. Residents listen intently to aldermanic candidates at Part II of the “Who’s Running?” Summit series. When R.A.G.E. is not hosting forums, attending community events, or just simply being regular-everyday folk – they meet monthly to discuss current events in the community, share information, fellowship, and seek concrete plans and actions steps to ensure that R.A.G.E. is always working towards a tangible goal that benefits Greater Englewood. R.A.G.E. is action-driven, goal-oriented, and dedicated to representing the good in Englewood. R.A.G.E.‘s presence in the community and the media has rapidly grown. R.A.G.E. members have made appearances on The Sanita Jackson Show on WVON 1690 AM, The Munir Muhammad Show on CAN-TV Channel 25, and First Business Chicago on WCIU. Check out R.A.G.E.’s very own, Asiaha Butler, as she discusses the vast array of assets and resources in Englewood on First Business Chicago, WCIU. Become a fan of R.A.G.E. and join our lively discussions on Facebook! !